Doesn’t it seem like dust and debris are always collecting on your pool table’s playing surface? Another nightmare can be an unauthorized visit by your pet to the top of your table. And then there’s the potential for spills. If you want to protect the table that is the pride and joy of your game room, you should know that we carry a wide selection of protective covers in a variety of fabrics, colors, sizes and designs — as well as officially licensed pool table covers from your favorite NFL, MLB or NCAA teams. Here at PoolDawg, we carry draping-style table covers that will get the job done, along with high-quality fitted models for a more custom look. Determine the table cover size that you need, then pick the style you like best. Whether you have a 7-, 8-, 9- or 10-foot pool table, we have the cover for you. As always, if you have any questions or just want to talk it out with an expert, pick up the phone and give us a call (during our office hours, of course). Replacing your pool table cloth can be expensive and a hassle. Billiard table covers offer protection that will greatly extend the life of your table’s cloth. Without a cover for the pool table, a pet such as a curious cat can scratch or stain the cloth. Someone inevitably will set a drink down on the table, and there will be a spill. The table will be used for a temporary storage pile, kids will smudge the cloth with sticky fingers, or the sun’s rays may fade the coloring. At PoolDawg, we’d much rather see you protect the playing surface (and your peace of mind) with a quality pool table cover. Billiard table covers are functional, but they can be stylish as well. Vinyl covers are available in multiple colors. The same is true of the heavy-duty covers made of resilient Naugahyde material, in case you want a looks-like-leather pool table cover. You can also order a leatherette cover with the Harley-Davidson shield logo for an 8-foot table. Here at PoolDawg, we welcome your questions about how to select the perfect cover. Size and durability are key factors. The size is based on the external dimensions of the table. Fitted heavy-duty covers have an 8-inch apron and provide a nicer, custom look. Because they are made of the Naugahyde material, however, they won’t stretch much, so the dimensions must be close. The benefit of this toughness: The fabric is less prone to tearing. Vinyl covers, which are less expensive and less durable, drape over the ends of the table and have weighted corners to keep them in place. Loyally serving pool players since 2003, we are the pool player’s best friend, and when you want your table covered, we have you covered. 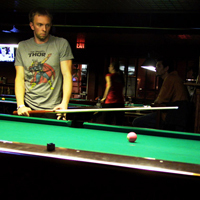 We offer safe and secure online shopping, and our staff includes people who actually play pool. 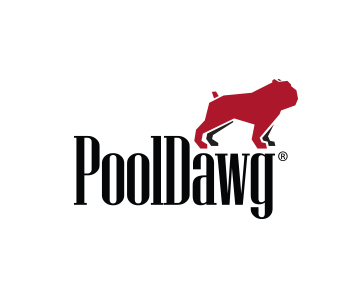 Contact us today with your questions about covers and to discover the PoolDawg difference.